Situated in Boofzheim, Camping Le Ried *** proche EuropaPark provides accommodation with access to a hot tub. Featuring a living room with a sofa, as well as a fully equipped kitchen, each unit has a private bathroom with shower. There is also an oven, microwave and a coffee machine. The camping offers a children's playground. Cycling and fishing can be enjoyed nearby, while water sports facilities is also available on site. Strasbourg is 40 km from Camping Le Ried *** proche EuropaPark, while Colmar is 52 km from the property. The nearest airport is Strasbourg International Airport, 38 km from the accommodation. Ce mobile home dispose d'ustensiles de cuisine, de plaques de cuisson et d'un micro-ondes. 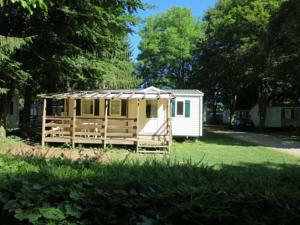 Voici la liste des communes proches de Hebergement Camping Le Ried *** proche EuropaPark. En suivant ces liens, vous trouverez les informations, la carte, les prévisions météo et la liste des hôtels les plus proches de chaque commune. Camping Le Ried *** proche EuropaPark : réservez avec Booking.com ! Camping Le Ried *** proche EuropaPark !